It appears that the big Anthropogenic Global Warming (AGW) cult summit in Durban South Africa has ended with a resolution that basically does nothing and amounts to a draft agreement that will be renegotiated by 2015 and come into effect by 2020. Raise your hand if you think any of this will actually be worked out and become binding by 2020. 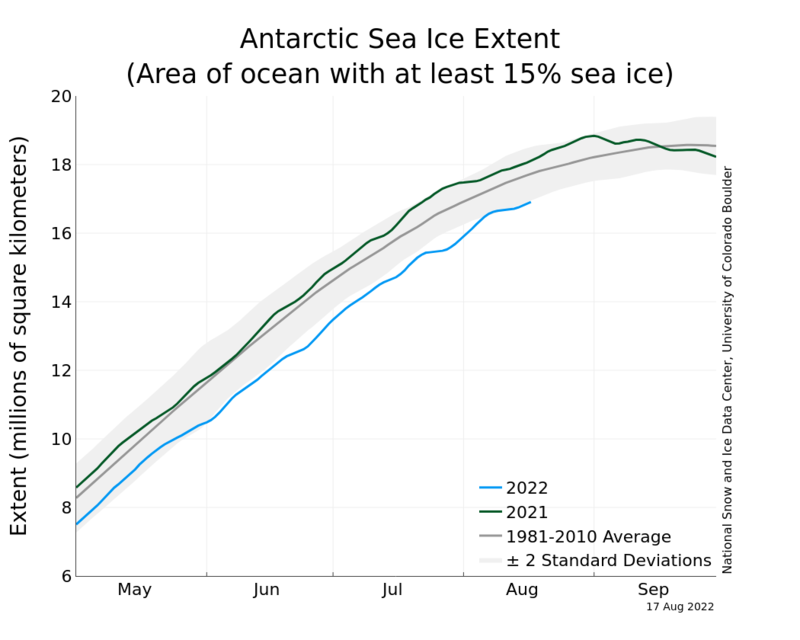 All of this dithering is fine with me since AGW is a myth and amounts to little more than a cult religion which has its real goal of forcing developed countries to finance developing countries by means of a Carbon Tax. Any resolution that is agreed upon by the UN members of this party in South Africa is meaningless unless countries pass legislation to put teeth to this resolution and while I can’t speak for other countries, the US does not have the backing in Congress to support the AGW lie and what little backing Congress does have for the AGW cult will decrease after the 2012 elections. 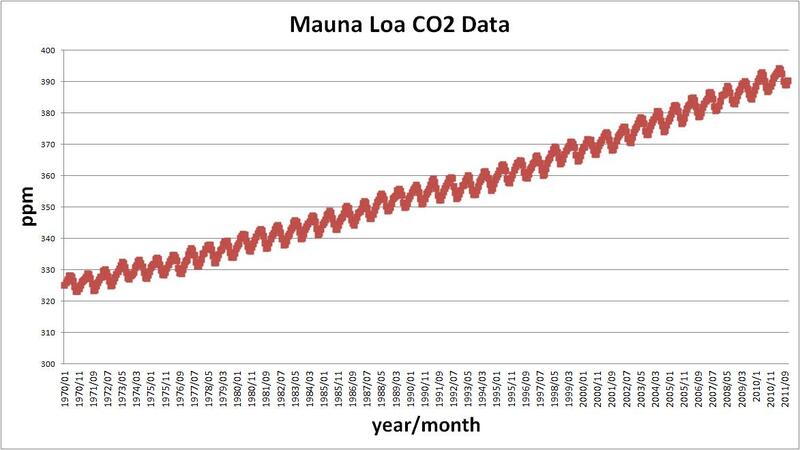 So in response to this nothing burger produced at Durban I want to take this opportunity to update the CO2 and global temperatures for your enjoyment. Let’s see if Earth is indeed on its way to “Warmageddon” or if the UN is just generating solutions in search of a problem. The first graph below shows the amount of CO2 in the atmosphere as measured in parts per million (ppm) and sure enough we are continuing to pump more CO2 into the atmosphere on a fairly linear rate and there doesn’t seem to be much change to that rate over the time period measured. This data was obtained from the Mauna Loa measuring station. The AGW cult places the blame for global warming solely at the feet of the CO2 molecule which comprising about 0.039% of our atmosphere. Let’s get some perspective on how much 0.039% represents on a total volume. A gallon of milk is roughly 4 liters so 0.039% of that is 1.5 mL. If you take a medicine dropper and measure out 1.5 ml you’ll find that it takes about 25 drops from an average medicine to equal 1.5 mL. According to the AGW cult, the equivalent of 25 drops in a gallon of milk is driving our global temperatures so this CO2 molecule is indeed magical. But wait, we must show correlation of increased CO2 emissions with global temperature increases before we make that claim. 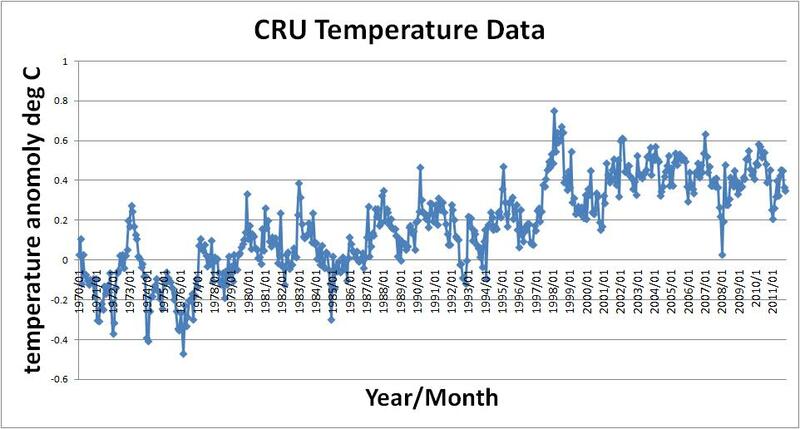 The next two graphs are generated from temperature data obtained from popular sources used by Climate Scientists – The University of Alabama at Huntsville (UAH) and the Climate Research Unit (CRU). When looking at the CRU temperatures over the past 14 years you can see that there is no trend up or down on temperature which is validated by the linear line fit having a slope of 0.00. 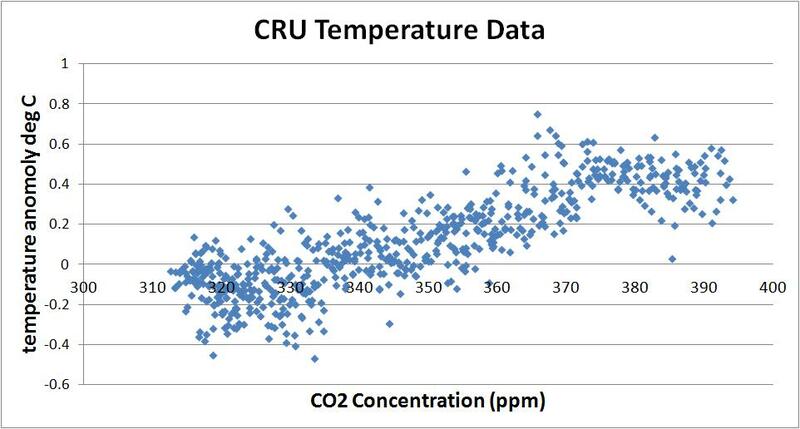 When you plot a correlation of CO2 vs. 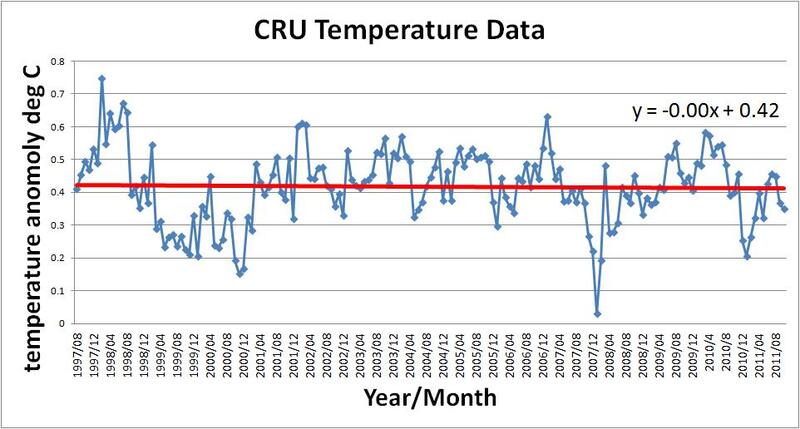 Temperatures from the Mauna Loa data and the CRU data you see that we have seen the correlation fall apart recently. Once the level of CO2 reached 370 ppm the temperatures stopped increasing. This suggests that CO2 is not correlated with temperature increase and there must be some other variable (or more likely variables) controlling our global temperatures. So good luck to all the UN members who continue to wring their hands and beat their chests regarding supposed global warming catastrophes but forgive me if I remain a skeptic and laugh at your feeble attempts to propose solutions to a non existent problem. If you are interested in further investigation….. I provided more detailed explanation of these graphs in an earlier post and you can check that out if you are so inclined. There is also a previous post where I provided directions how you can check the temperature monitoring stations in your local area and see for yourself whether or not you see global warming increasing at a catastrophic pace. I actually disagree with this point, but I can see how someone might think that. The UN has shown time and time again that it is not interested in the “development” of former third world countries. Whether it is banning DDT use, leading to over a million deaths, or forbidding industrial development, the “international community” (which presumes to speak for all of us) gets in the way of real economic progress, including stimying free market capitalism. Such economic reforms would entail spurring self-sufficiency, which is against the self-interest of the ruling elites. Instead, I see the UN as a quasi-communist body set up by known socialists like Lauchlin Currie, Eduoard Daladier, and Vyacheslav Molotov in order to set up a global parasite espousing feel-good truisms for the purpose of sheer exploitation and political manipulation. You bring up great points and I might have simplified the situation. It does appears that world communism is their aim and you’re probably right. This may be true, such as recent theories of sunspot effects on cosmic rays and cloud formation suggest (we were in a scarce sunspot period recently), but we should also factor in that the warming effect of CO2 is not linear, but logarithmic. 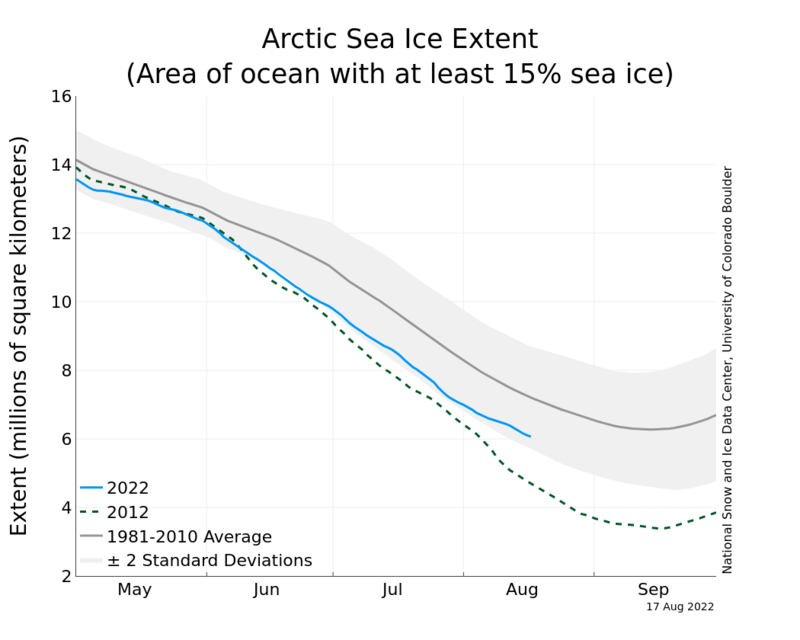 Of course, this means that more carbon dioxide added to the atmosphere has an increasingly diminishing effect. 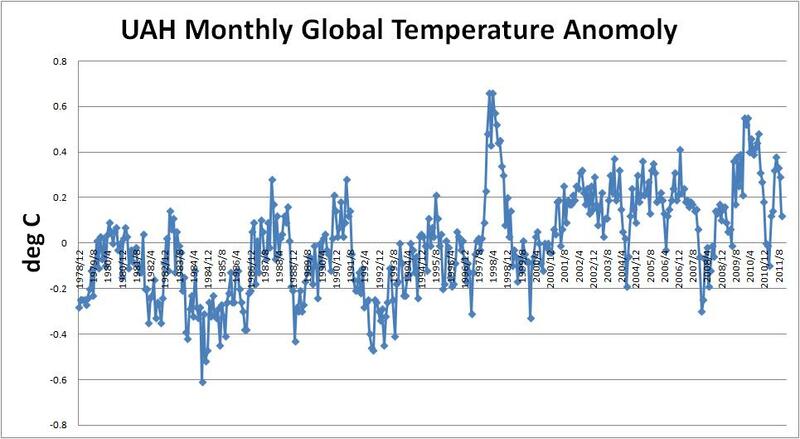 Yes, it is my feeling that the CO2 effect has saturated as shown in the temperature anomoly vs CO2 graph in this post. After about 370 ppm the CO2 correlation fell apart. There is no argument from me that CO2 is one of many greenhouse gases but I believe its forcing has been exaggerated. The atmosphere interaction with our global temperatures are too complex to give such a high weighting to one molecule.